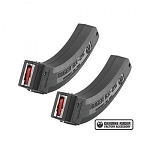 We offer the best selection of magazines and magazine accessories for your Ruger 10/22: High capacity magazines from the best and most reliable manufacturers. Dummy magazine extensions... Just for looks as well as a practical grabbing point. Magazine speed loaders. 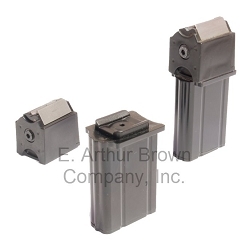 Connectors and conversion kits for factory magazines... And of course, we also sell Ruger factory 10/22 magazines. Purchased another stainless EABCO Accuracy barrel for my Encore in 6.5x55 Swedish Mauser, and could not be more pleased. Barrel produces sub-MOA groups with the right hand-loads, and should be a deer-getter. I can't wait to get into the field with my Encore this season. Excellent quality and quick service. Buy from E A Brown, you won’t be disappointed in the customer service nor the quality of the products they offer. Wow! 1/4 MOA, I like it! Purchased a Savage Barrel Kit 260 Remington including Channel Forend ( Custom Stock from Boyd's) and installation of muzzle brake. Craftsmenship was superb to say the least. FLAWLESS ! After following recommended break in procedures and cleaning, the time came to test the rifle's accuracy.. My first 3 shots grouped sub moa. The rifle shoots half inch groups consistently with 140gr. ELD-M bullets and my best group to date is 3 rounds measuring .185" . I am absolutely impressed with the low price and quality of your product.. My rifle shoots as well or better than some rifles that cost thousands more! Thank you so much. Copyright E. Arthur Brown Company Inc. All Rights Reserved.